He was already loved - by the State. In the recent years, some of my closest and most beloved friends have become parents, some of them for second time. In the collective congratulation messages that they received from the rest of us there was one that drew my attention particularly: "welcome to the world of unconditional love". Is it true that we can do everything for all those who are our blood? Leo Stepanovich Demidov feels proud of his job and its mission. He's the founder of a new police that is in charge to observe and punish all those who betray the State using the State itself in a corrupt way. He's building a new nation and, it is the nation that has rewarded his loyalty with a good house and a good life for his wife and daughters. But the price of these privileges has not been small and his conscience is not tranquil as there are many faces, many lives, many mouths silenced in his past and soon Leo will learn why is good to never forget the names and the faces of your enemies. He found forgetfulness easier than asking for forgiveness. Nikita Khrushchev has taken charge of the Soviet Union and with this, he began the de-Stalinization of the State. The Cold War is at its top and the atmosphere in Moscow will be rarefied. There is not free speech, there is not chance for uncensored expression of ideas, but at the same time, it feels like something has changed. -Free my husband, or I will murder your daughter. In the middle of these odd circumstances, Leo finds himself chasing a young murder through the sewers in Moscow, learning later that vory (Russian gang) behind the kid is deeply linked to his own past. The leader of the gang wants revenge against Leo who happens to be the former soviet officer that arrested his husband and sent him to the gulags. Leo will need to use all his influence and contacts and risk his own life in order to save his daughter's. Keep an eye on: the historic context described by Tom Rob Smith, the change in the Soviet Union with its new leader, the internal conflict of Leo's daugther, Zoya; and of course, the havoc in Leo's convictions that will lead him to choose a new path in his life. Death would feel less empty than life. 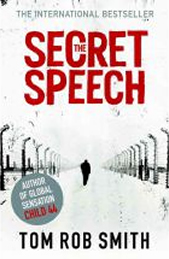 With Child 44, Tom Rob Smith demonstrated to be a gifted writer; with The Secret Speech we learned that a compelling author was rewriting the canons for thrillers; with Agent 6, we are witnessing the consolidation of the best novelist ever.